All rooms are furnished and decorated. Cleaned every day, the large and equipped kitchen is made available for communal use. There is also a Non - smoking area on the front, a beautiful courtyard - garden on the back with chairs to chill, and an open space upstairs to relax, read, or more. 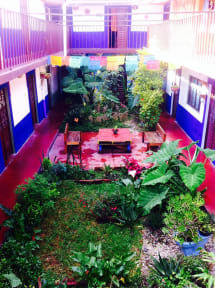 Situated in El Centro district of San Cristobal de las Casas you can find all major attractions within walking distance. Only Cash accepted as payment on arrival. Please advise of arrival time upon booking.